I recently met with my financial advisor to “rebalance” my … retirement portfolio. Based on my “age and stage of life” his allocation model showed a 50% bond allocation. I laughed and asked him if the company allocation model assumed interest rates would rise over the next 10 years? His answer was “yes- of course.” I showed him the graph below which shows lower than average TOTAL returns in a rising interest rate environment and he checked his long-term data and found that bond holders between 1953 and 1980 had actually lost money. 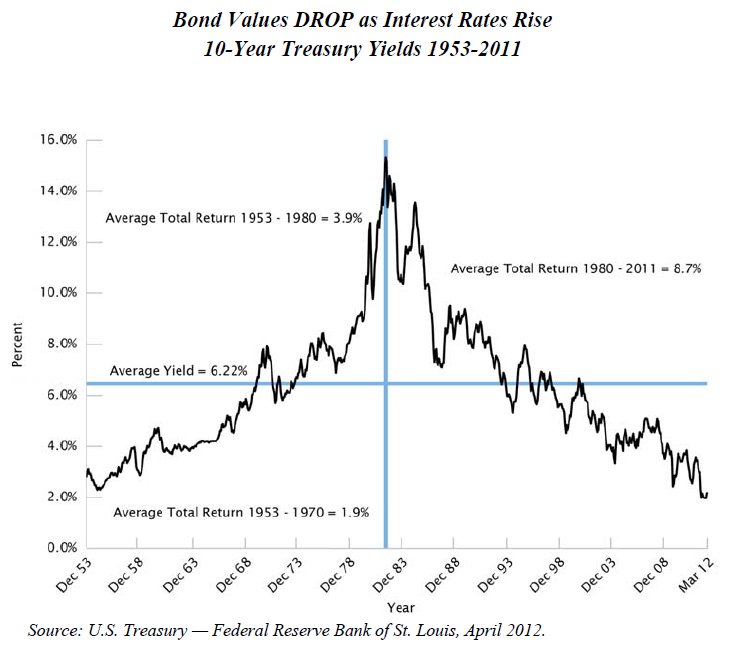 We all know that as interest rates rise, bond values decline and thus the total return can be small or negative. Not to mention that a 10-year treasury at 1.5% is below expected inflation and thus a NEGATIVE REAL RETURN. He agreed that a bond allocation did not make much sense, but since my investor profile was conservative what was the alternative?